With its long, wispy bristles, Brush 19 is Wayne’s go-to for a seamlessly blended smoky eye in seconds. Designed with small and hooded eyes in mind, the slim shape reaches deep into the crease while the ultra-soft hairs pick up and lay down the perfect amount of pigment—making it a foolproof choice for fast, flawless eye looks. Brush 19 is also available with The Eye Set. Sweep the tip of the brush back and forth to blend color. Blend color into the crease for an eye-opening effect. Pat highlighter into the brow bone and cupid's bow for precision highlighting. 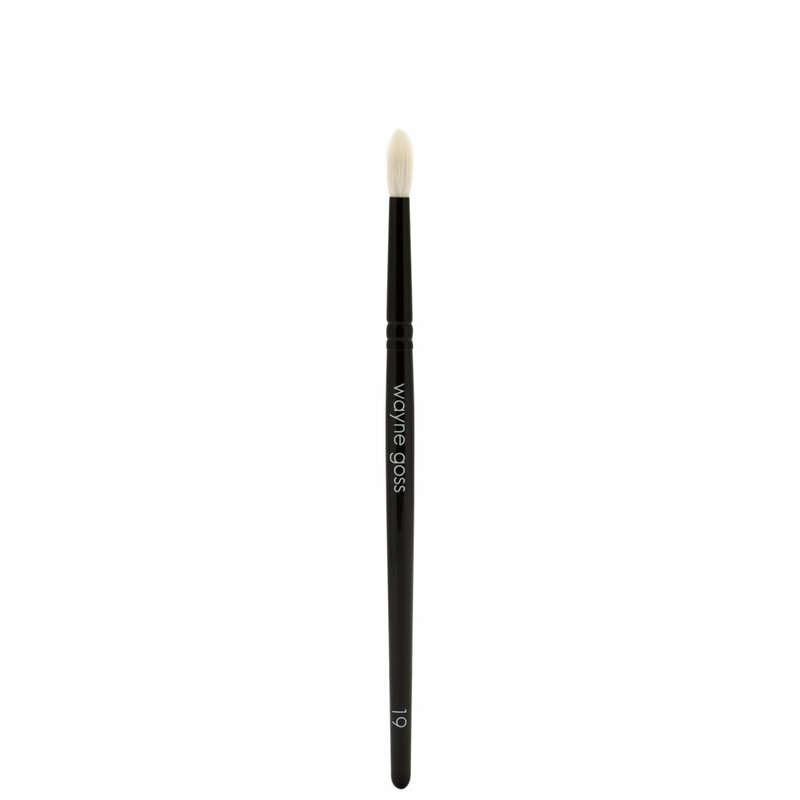 Have a question about Wayne Goss Brush 19 - Eye Shadow Precision Blending brush? So soft, and a good investment since it works even with the crappiest shadows. The 19 is great for hooded eyes, to pick up color and blend. It's now my favorite brush. Saving up to get more! I have mature hooded eyes and this brush is so perfect for applying shadow in my crease. It is so soft and gentle on my aging eyes. I can do such detail work in my crease with it. If you have hooded eyes I would highly recommend this brush! Where has this brush been all my life ! 60 and I suffer from red, itchy and dry eyelids from applying eyeshadow with the WRONG brushes. I now use the WG brush with soft windshield motions to create the perfect eye look. I no longer have horrible looking eyelids. Since purchasing this brush I also added 5 more WG brushes to my collection including the Blue Scquirel brushes . So very happy. Thank you ! Hooded or small eyes “look out” it’s coming for you! I have smaller eyes with a slight hood and this is my new favorite for blending out my crease. My Mom has seriously hooded and mature eyes and guess what she’s getting as a stocking stuffer? Yep, Wayne’s brushes are soft, they are a lovely taper and they perform flawlessly. I initially purchased the Wayne Goss eye set, but I found I needed the #19 brush for so many other details (blending under eye concealer, that pop of shimmer in the corner of my eyes, perfect nose contour) that I needed to order more. I love this brush and should you have small, hooded, or mature eyes this is the brush you want in your arsenal. I was watching Mel Thompson use these brushes and finally caved and bought the #19 and #18. The shapes of the brushes are amazing and they work better than I could have imagined. I love them! Love these new brushes for my hooded eyes. Cheek brush too. Fan is pretty good too but I like the original a wee bit better for placing products. Wayne Goss' brushes are probably the best I own. I am amazed at their quality. I just can't wait to collect more. These brushes are so soft and nice. I love a lot of my synthetic brushes but I almost don't want to use them anymore because these feel so great on my eyes when I'm applying shadows. This one is really nice for getting into those small areas around the hood of my eye.